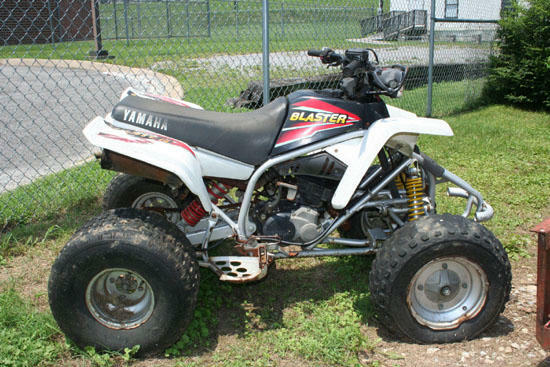 This Yahama Blaster 4-wheeler will be auction July 17. The Cannon County Sheriff’s Department will conduct a Seized Vehicle Auction on Saturday, July 17, 2010 beginning at 9:00 A.M.
A total of 17 vehicles will be sold at the sale “AS IS” with No Warranty. Some are in good running condition and some need repair. The list of vehicles for sale may be changed on the day of the sale. The vehicles may be inspected prior to sale date at the Cannon County Jail during normal business hours, Monday through Friday from 8:00 A.M. until 4:00 P.M.
Money received from the auction will be turned over to the County Trustee and will be deposited in the Sheriff’s Department’s Drug Fund. For more information contact the Cannon County Sheriff’s Department at (615) 563-1000.